D.46A. Paris, Louvre, RF 559. Pen and ink and wash, heightened with white, over traces of black chalk, 27.6 x 33.8, lightly squared in black chalk at the lower right; laid down; wm?. 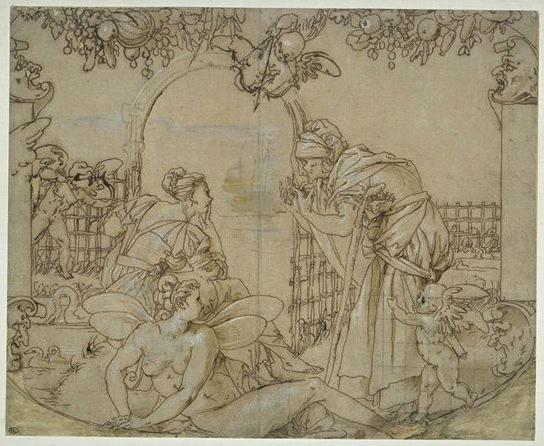 The lower corners are cut and filled, with the lower part of the mask at the lower left and the right foot of the nymph in the foreground added; a hole in the mask at the upper left and behind the putto at the left, the fence in the latter area re-drawn; torn, filled, and re-drawn along the center of the bottom edge; a hole in the right hand of the putto above; upper left edge partly missing, filled, and re-drawn. PROVENANCE: His de la Salle (Lugt 1332 or 1333). Given to the Louvre in 1878 (Lugt 1886). Tauzia, 1881, 79-80, no. 99, as Rosso. L’art rétrospectif, exh. cat., Versailles, Palace, 1881, no. 682. Dimier, 1900, 313, as Rosso, for the Pavilion of Pomona. Herbet, V, 1902, 81 (1969, 233), under no. 37, as Rosso. Müntz, 1902, 158, questioned Rosso’s authorship. Dimier, 1905, 19, Fig., as Rosso. Fröhlich-Bum, 1921, 130, and Fig. 141, as Parmigianino. Lavallée, 1930, 22, no. 60, and Pl. XLV, as Rosso, c. 1534. Kusenberg, 1931, 94-96, 137, 146, no. 76, and Pl. LIV, as Rosso, 1530-1536, but also as done before April 1534, for the Pavilion of Pomona; and as technically similar to the Allegory of Deceit. Sterling, 1935, no. 682, as Rosso. Becherucci, 1944, 32 (1949, 31), as Rosso around 1532-1535. Benesch, 1947, III, Fig. 60, as Rosso. Lavallée, 1948, 22, as Rosso. Meisterwerke, Albertina, 1950, no. 7, as Rosso. Barocchi, Commentari, I, 1950, 159, as Rosso. Barocchi, 1950, 213-214, 251, and Fig. 191, as Rosso. Longhi, 1951, 59 (1976, 99), as not by Rosso. Adhémar, 1954, 126, and Fig. 19, as Rosso. Bacou, 1955, no. 75, as Rosso. Béguin, 1960, 38, as Rosso (but wrongly as in the École des Beaux-Arts). Berenson, 1961, no. 2450A, as Rosso. Pouncey, 1964, 290-291, as Rosso. Carroll, 1964 (1976), I, Bk. I, 235-238, II, Bk. II, 368-372, D.39, Bk. III, Fig 103, as a copy of a lost drawing of around 1532 or 1533. Monnier, in Seizième Siècle… Dessins du Louvre, 1965, 61-62, no. 137, and Pl. XXXIII, as Rosso. Shearman, 1966, 164, as Rosso, from his French period. Zerner, 1968, XLIII, under A.F. 38, doubted the attribution to Rosso. Béguin, RdA, 1969, 105, hesitated to accept Zerner’s judgment. Béguin, 1970, 9, 88, Fig. 8, as Rosso, for his fresco in the Pavilion of Pomona. Weiss, 1971, 57, Pl. LII, Fig. 172, as Rosso. Bacou and Béguin, in EdF, 1972, 189, no. 214, and Fig., as Rosso? Miles, 1973, 32, n. 4, as too stiff to be from Rosso’s hand. Neilson, 1974, 170, as a copy after Rosso. Golson, in Actes, 1975, 231, 233, Fig. 2, as probably a copy after Rosso to serve the artist who executed the fresco or a later copy for a tapestry. Darragon, 1983, 28, implied it is an autograph drawing. Cox-Rearick, 1984, 122, n. 16. Carroll, 1987, 199, 200, 202, as a copy of a lost drawing by Rosso. Scailliérez, 1992, 128, no. 55A, 129, Fig. A, as an incomplete copy of Rosso’s fresco. Brugerolles and Guillet, 1994, 68, 70, n. 5, 71, Fig., under no. 24, as a copy after Rosso. 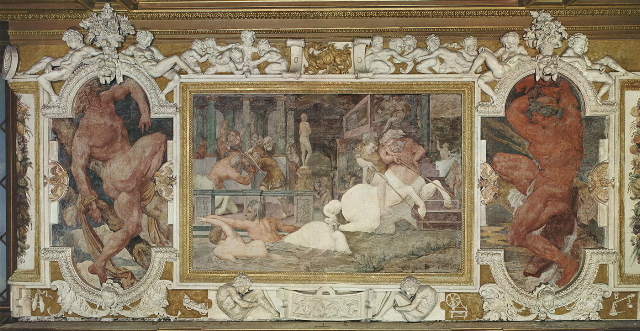 Since 1900, when Dimier commented on the Louvre drawing, it has always been recognized as related to Rosso’s composition that was painted in the now destroyed Pavilion of Pomona at Fontainebleau (L.39). Stylistically, the image resembles, in the postures of the figures aligned to the picture plane and in the richly folded garments of the main characters, Rosso’s painting in Città di Castello executed in 1529-1530 (Fig.P.20a). But in the same respects, and with the thrust into space in the center seen in Fantuzzi’s etching of the complete composition (Fig.E.62a), it is also similar to Rosso’s Annunciation of 1531 or 1532 in the Albertina (Fig.D.43a) and to the Loss of Perpetual Youth (Fig.P.22, II S a) and the Education of Achilles (Fig.P.22, II N a) in the Gallery of Francis I, although those scenes have more episodes and more figures. 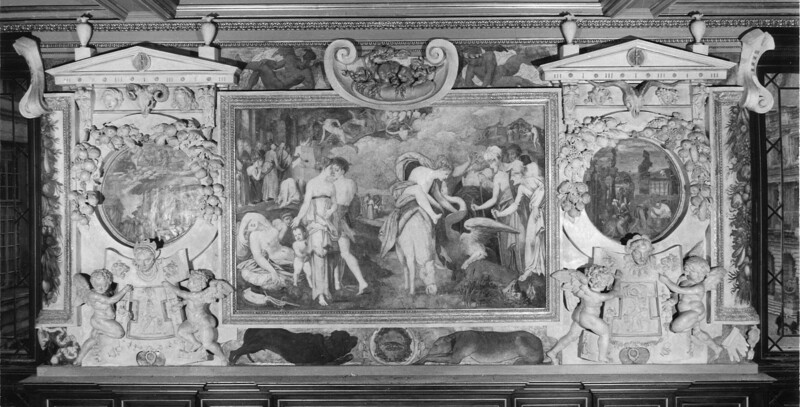 Like these three works, the Vertumnus and Pomona would seem to have been invented before April 1534, when the actual execution of the decoration of the gallery seems to have been begun. Most likely, the Vertumnus and Pomona was composed before mid-1533 or in 1532 when, it can be conjectured, the Pavilion of Pomona was decorated (see L.39). Until recently, the Louvre drawing was thought to be an autograph drawing, although already in 1902 Müntz cast doubt upon this attribution. A comparison of the handling of the drawing with any of Rosso’s surely autograph pen and wash drawings, such as the Throne of Solomon (Fig.D.34) and the Pandora and Her Box (Fig.D.67a), and with similarly executed drawings that are also heightened with white, such as the Mars and Venus (Fig.D.42a) and the Annunciation in the Albertina (Fig.D.43a), indicates that the clumsily executed Vertumnus and Pomona cannot actually have been executed by Rosso. The pen lines are monotonously thick and unvaried and the washes and highlights are in places so uncontrolled as to appear little more than smears. However, the drawing has received serious attention as an autograph drawing and hence must be looked at carefully for what it does actually present. 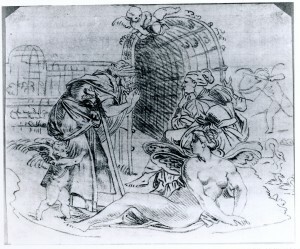 As Fantuzzi’s etching of this scene is in reverse of the drawing, the latter cannot have been copied from it. Furthermore, the print, because it shows a complete background, only part of which appears in the drawing, cannot have been copied from the latter. 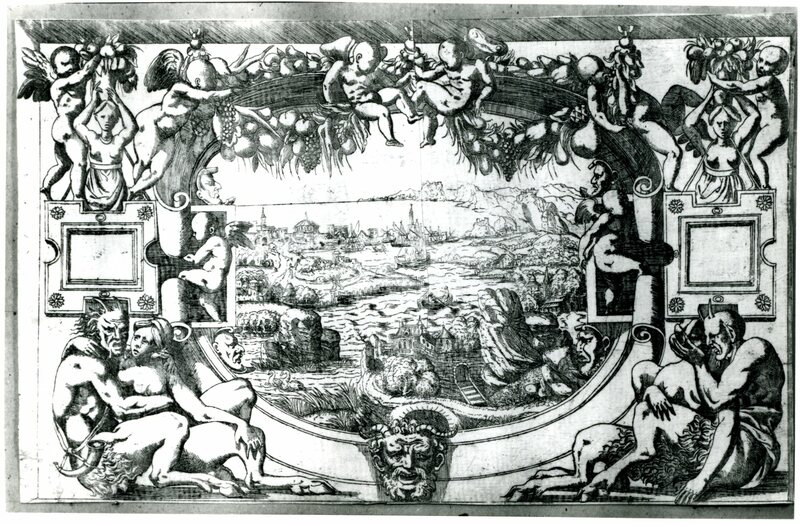 Fantuzzi’s other etching related to the Pavilion of Pomona, but of the stucco frame that was designed for the Vertumnus and Pomona (Fig.E.63), shows details, such as the four masks at the sides, that are not, in their specific character and positions, the same as those found around the edges of the Louvre drawing. Hence, the drawing from which his etching of the frame was made – supposing that it had in its center the composition of Rosso’s narrative scene, which is unlikely – would not have served Fantuzzi for his etching of Vertumnus and Pomona. 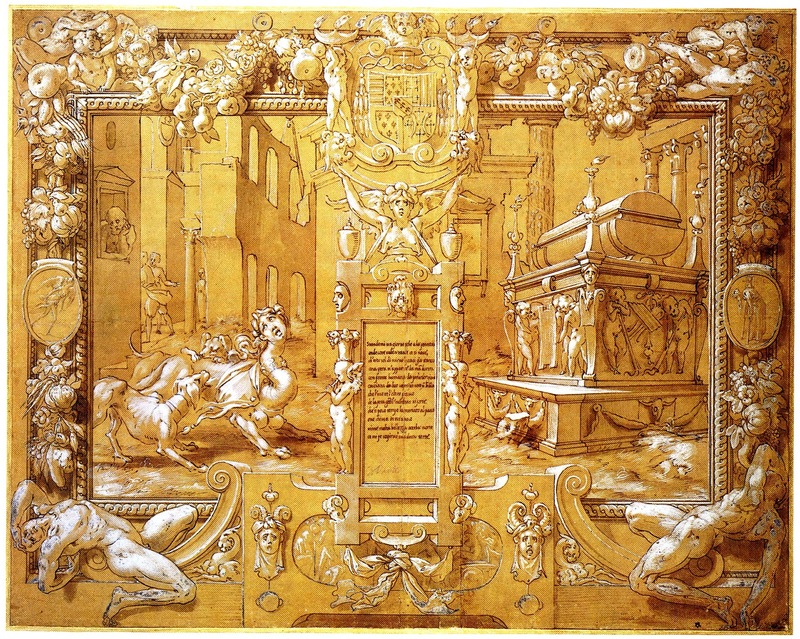 However, the few details of a frame in the Louvre drawing are very similar to what appears in the latter etching by Fantuzzi, except for the absence of the wing that juts into the drawing at the left, the slightly higher placement of the garlands above, and the square format of the etched scene which is set within an oval in the drawing. 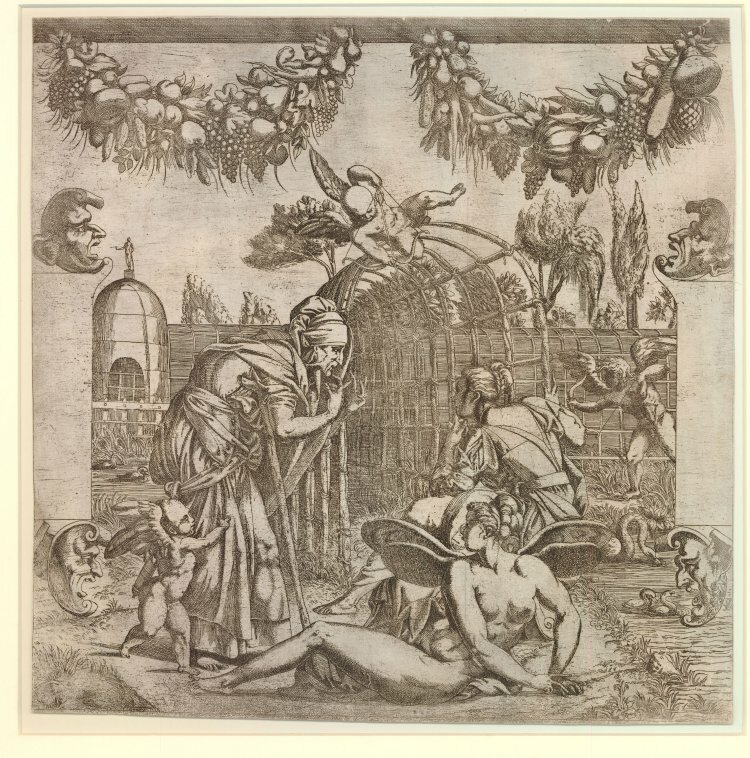 What at first seems likely is that the Louvre drawing and Fantuzzi’s etching of this scene are both copied from a single lost drawing by Rosso that Fantuzzi only slightly altered with respect to the differences noted above. 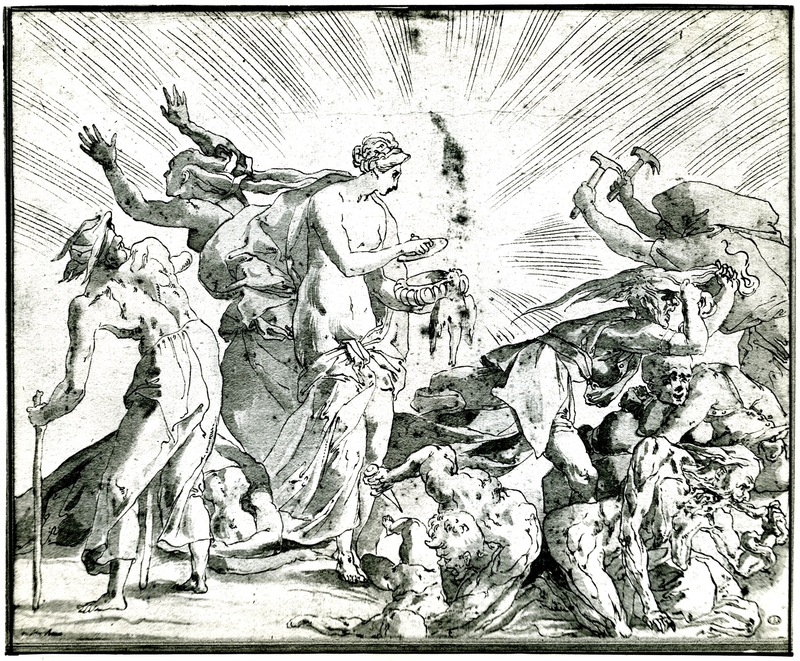 But there is also evidence that suggests that there was another similar but more finished drawing by Rosso that Fantuzzi actually used for the etching. In regard first to the Louvre drawing, it is clear that its penmanship, in its awkward way to be sure, is following closely the kind of subtle and sure use of the pen that can be found in Rosso’s Mars and Venus, in the Albertina Annunciation, and in the Petrarch drawing at Christ Church (Fig.D.47a). But the washes and white highlights do not resemble as much as they should what appear in Rosso’s drawings. On the body of the nymph, on the clothing of Pomona and Vertumnus, and elsewhere, relationships of dark and light strokes are quite uncertain as to what exactly they describe or what effect they intend. 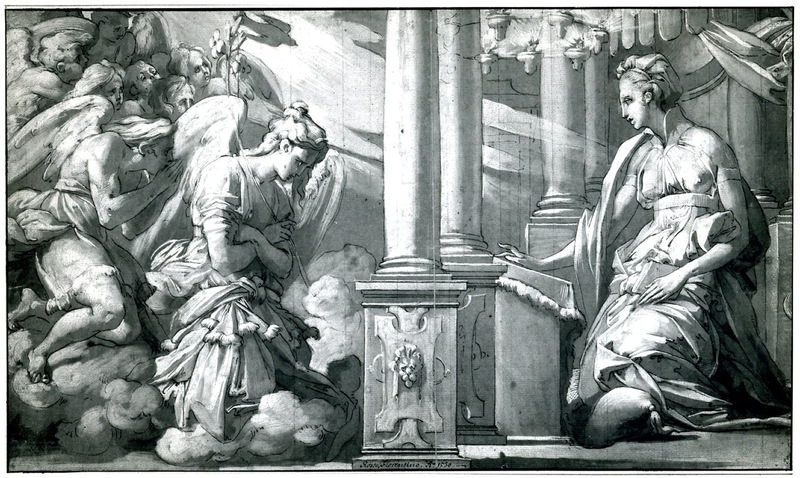 What is very likely is that this copy was made from a drawing by Rosso that was executed on a dark ground with dark washes and white applied over it, and that, therefore, had a total chiaroscural and luminary effect like that of the Albertina Annunciation, to which in other stylistic respects the Vertumnus and Pomona is closely related. The translation of such a drawing into one done on a light ground may well account for the indecisive relationships of the lights and shadows in the copy. The ineptitude of the copyist may also account for why he did not attempt to draw the trellis in perspective in the background of Rosso’s composition. 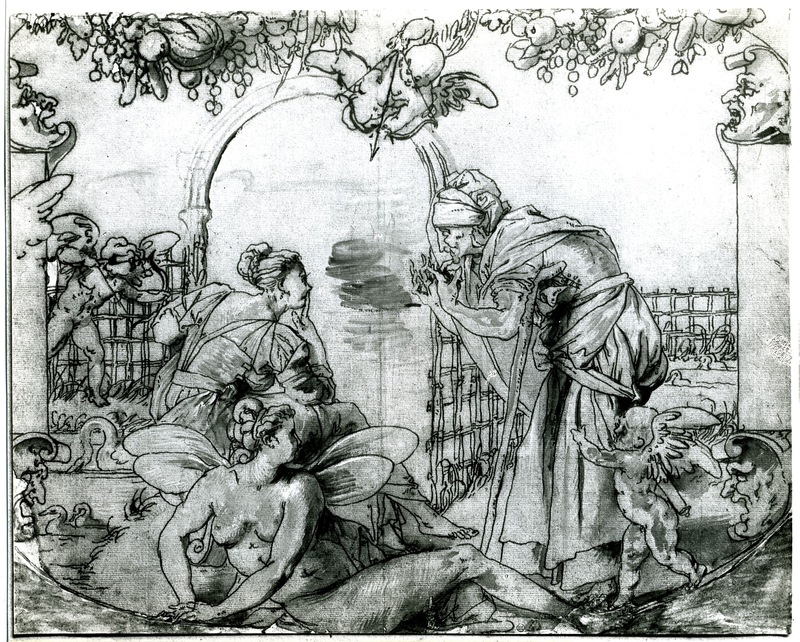 It does appear in the background of the drawing in Brussels, which is a counterproof of another lost copy in black chalk of the same lost original by Rosso, executed in pen and ink and wash, heightened with white. This drawing also shows the scene curved at the bottom, and there is perhaps a record of a mask in the squiggle at the lower left. But no other details of a frame are shown, suggesting that the lost original drawing showed no more of it than appears in the Louvre copy. The copyist of the Brussels drawing has given hair to two of the putti, and has changed the positions of the putto and his bow at the top, perhaps because he did not have enough room on his sheet to copy Rosso’s figure exactly. He has also filled in the back of Pomona’s dress, which reveals a bare back in the Louvre copy. But other details are the same, including the positions of the swan and cygnets and the line of the bank behind Pomona. 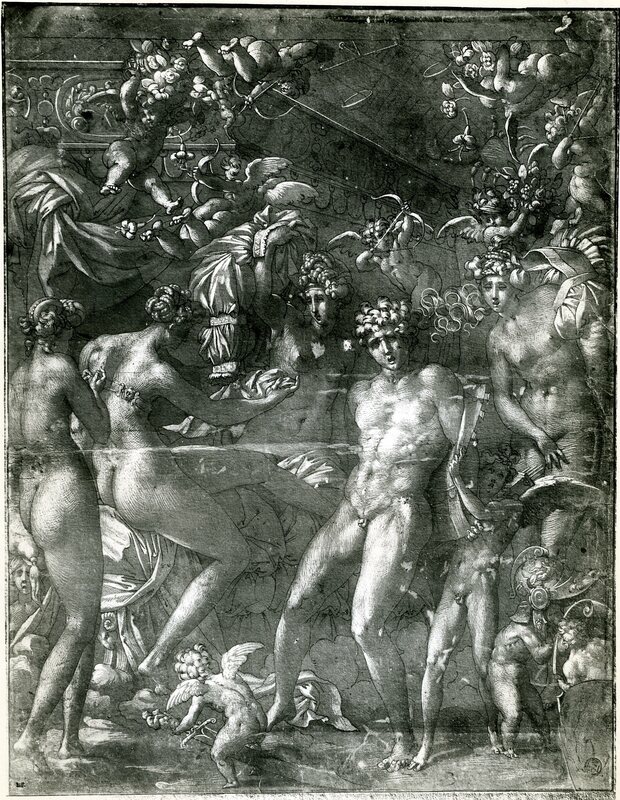 These last details are not as they appear in Fantuzzi’s etching, which, being in the same direction as the Brussels drawing, could not, in any case, have been the model of the drawing from which the counterproof was taken. The album in Brussels contains another counterproof of a copy by the same copyist of a drawing by Primaticcio,4 indicating a drawing source also for the Vertumnus and Pomona counterproof. Had it been derived from Rosso’s lost fresco it might be expected to resemble more Fantuzzi’s rectangular composition, which seems to have been the format of the executed painting, and the later drawing by Rosso from which he made his print. The Brussels drawing, attributed to Van Thulden, but also to Abraham van Diepenbeeck,5 shows that Rosso’s lost drawing was complete, and probably also that it did not show much more of a frame. It copies the gesture of Pomona’s far hand more clearly. 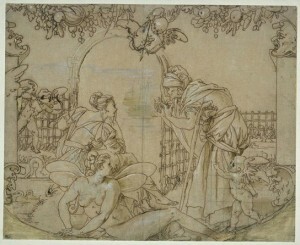 The decoration of the nymph’s wings may have been part of Rosso’s drawing that does not appear in the Louvre drawing but that can be found slightly indicated in Fantuzzi’s etching. 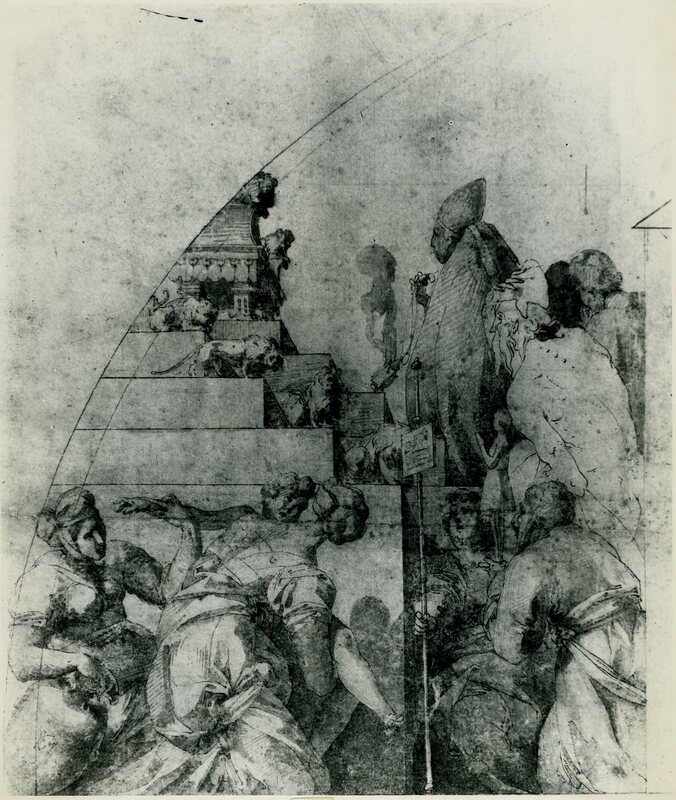 The squaring of the lower right of the Louvre drawing may well copy a section of the squaring (or all that there was) of the original drawing, indicating perhaps that the lost drawing was intended to be enlarged as a cartoon for the fresco that would be executed. Another drawing would have been for the frame. 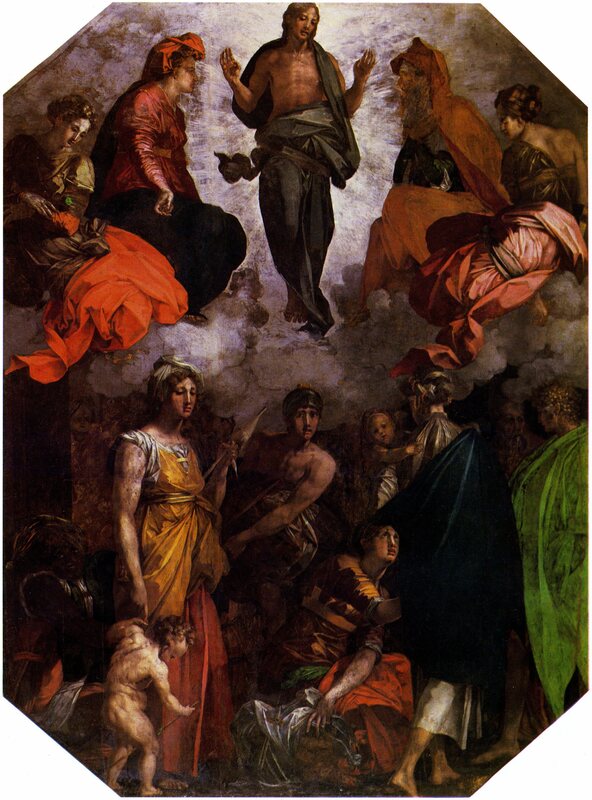 From it, Fantuzzi would have made his other etching that shows what Rosso at first intended to surround his and Primaticcio’s frescoes. 1 Theodoor van Thulden, 1991, 117, gives inv. no. S.V76801-76864 for the sixty-six drawings in the volume. 2 Theodoor van Thulden, 1991, 117, states that the drawings are in black chalk, sometimes heightened with red chalk, with fol. 45 entirely in red chalk. The dimensions vary from 21 x 12 to 30 x 23. 3 Wilson-Chevalier thought that folio 49 was also related to the Pavilion of Pomona, but I see no correspondence in the drawings on it to any other material that is known to be related to the pavilion. The reclining woman with a basket of fruit accompanied by two children is related to a drawing by Primaticcio in the Ensba, Paris (M.1157), but this cannot be related to the pavilion where, as Mariette indicated, the two identical stucco frames were designed by Rosso (see L.39). 4 Fol. 23; Wilson-Chevalier, 1982, 12, Fig. 13; see also Sylvie Béguin, Il Cinquecento francese, Milan, 1970, 89-90, under Fig. 15, mentions this copy and another after a second drawing by Primaticcio in the same album (Fol. 24). 5 See Wood, 1990, and Wood, Jeremy, review of Theodoor van Thulden, 1991, BM, 134, 1992, 327-330.